Reading at Jefferson Market Library, 425 Avenue of the Americas (near West 10th Street), on Sunday, October 8, 2-4 p.m. I will read excerpts from my novels and New York stories, sign books, and take questions. Books will be available for purchase. I'll be glad to see a friendly face or two. For my two short poems "Rush" and "Signals," published by the online poetry review Colloquial, click here. The Cavendish banana, the only kind we get. Bananas have to ripen in a certain way. Don’t put bananas in the refrigerator. Little did I know at first that the lady’s sponsor was Chiquita Brands International, the chief producer and distributor of bananas in the United States, and that this was the successor to the United Fruit Company of ill repute, which saw fit to change its name. Founded in 1899, the United Fruit Company came to dominate the international banana trade throughout much of Latin America, especially Central America, whose small nations came to be known as banana republics. There is little doubt that the company engaged in neocolonialism, never hesitating to interfere in the internal politics of those small countries. Especially flagrant was its lobbying the U.S. government to overthrow Jacobo Arbenz, the democratically elected president of Guatemala, whose leftist policies of reform threatened United’s interests. This was the time of the Cold War, and to the U.S. government Arbenz looked dangerously leftist, even Communist. In 1954 a small CIA-backed army invaded Guatemala, and Arbenz was forced to resign and flee, replaced by the right-wing dictatorial regime of Castillo Armas. the CIA. Assassinated in 1957, he was celebrated as a martyr by the Guatemalan right. In the early 1960s, innocent of any strong political opinions, I visited Mexico and Guatemala as a tourist eager to see ancient Mayan sites, climb pyramids, improve my Spanish, and buy bright-colored serapes in the open-air market of Oaxaca. In both countries I saw bananas on a tree with big, floppy leaves, and was informed that the tree would bear two years and no more. And in the markets I saw kinds of bananas I had never seen before: big green things called plantains, which were meant to be cooked, and others that I don’t now clearly recall. pointing up. The blue bags keep off bugs. But there in banana land I sensed a distinct difference in political atmosphere between the two countries. In Mexico I encountered a relatively free political atmosphere and in the heart of Mexico City witnessed a massive march of protesters hostile to the government of the long-ruling, monopolistic Institutional Revolutionary Party. Jokes were even permitted about López Mateos, el señor presidente. In Guatemala, on the other hand, I saw no hint of political activity, only posters with a photograph celebrating the benign rule of the bemedaled military officer then in power. Nor did I have any awareness that in the very year of my visit, 1962, guerrilla warfare against the regime was beginning, inspired by Fidel Castro’s recent success in Cuba. Only later did I learn that United Fruit had worked hard, and with success, to influence my consumption of bananas in New York State. New York is a great apple-growing state and always has been. One October, when going upstate by bus to a cousin’s wedding, for miles on either side of the highway I saw vast orchards laden with apples fully ripe and begging to be picked, which within a few days they surely were. And in the New York City greenmarkets I have seen dozens of kinds of apples flood the stands in September and October, when fresh-picked apples have a taste they will never have again. Even in late spring I have counted eleven different kinds of apples in a single greenmarket stand, and this was late in the season for last year’s crop. So why this digression about apples, in a post about bananas? Because long ago United Fruit with infinite cunning undertook to supplant the native-grown apple with the imported banana as New York State’s favorite fruit. How to do it? By making bananas even cheaper than apples. To do this, United cleared rain forests in Central America, planted vastly, built railroads to transport the fruit, and devised refrigeration techniques to control ripening. There are hundreds of kinds of bananas in the world, but by growing just one kind, the disease-resistant Cavendish, United made sure that all the bananas in a shipment would ripen at the same rate, thus realizing huge economies of scale. But United went further than that: it promoted its product in ways unknown to apple-growing farmers and grocers: discount coupons, jingles (“I’m Chiquita banana…”), and placing bananas in schoolbooks and on picture postcards. Doctors were hired to convince mothers that bananas were good for children. And to keep prices low, United conspired with (or arm-twisted) Latin American governments to deny workers health care, decent wages, and the right to organize. Result: according to a 2008 article in the New York Times, Americans eat as many bananas today as apples and oranges combined. One might think otherwise, seeing all the orange peels that litter the American landscape, along with used condoms and plastic spoons, but such is the case. And this, even when Americans are being urged to eat foods grown locally, and New York City is a seething mass of self-proclaimed locavores. conveyor belt to freight cars that will carry them to points west, 1937. Just getting the bananas to sidewalk stands and groceries is an almost epic endeavor. In an article entitled “The Secret Life of the City Banana” by Annie Correal, in the Metropolitan section of the New York Times of Sunday, August 6, the whole undertaking is chronicled. Huge container ships bring 4 million bananas each in refrigerated containers to the Red Hook Container Terminal in Brooklyn, but many more refrigerated bananas arrive by truck from out-of-state ports like Wilmington, Delaware. 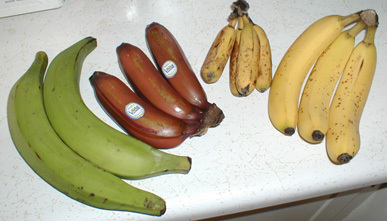 Since bananas are rich in potassium, which is slightly radioactive, those arriving by ship go through a radiation detector at the terminal, and a few containers are inspected there by customs and border protection personnel. Next, the bananas are sent in cartons by truck to a ripening warehouse in North Bergen, N.J., where, still green and hard, they are placed in stacks in a cool, dark ripening room filled with ethylene, a synthetic version of the hormone that sets off ripening. Four days later, ripe at last, they are trucked to restaurant and fruit-stand suppliers, wholesalers, and groceries. And so they appear at the sidewalk stands where you can buy them, usually four for a dollar. And buy them I do, while I can, for the Cavendish is susceptible to a new strain of Panama Disease known as Tropical Race 4, or TR4, which will in time afflict it. Meanwhile I buy and I chomp. I'm not the only one who likes them. Just when I thought I was done with bananas, I encountered a full-page statement on page 15 of the first section of the New York Times of Sunday, August 20, announcing that on Monday, August 21, Chiquita would move the moon in front of the sun to create an enormous yellow crescent in the sky, known as the Chiquita banana sun, a fiery Cavendish to be seen by everyone on the planet. Those thinking the totality -- the total eclipse, seen only in certain areas -- was worth traveling a long distance to behold, were misinformed; what counted, the ad insisted, were the two momentary banana suns, one before the totality and one after, which everyone in North America could see ("We planned it that way!"). How Chiquita would create the two banana suns was illustrated clearly with pictures, accompanied by a warning not to look at the Chiquita banana sun without protective eyewear. The source of this delicious nonsense: thebananasun.com, where the brand name continued to be linked to the eclipse. As always, Chiquita knows a good thing when she sees it, and gets her name in front of the public at every opportunity. Clever, I admit. For two new LibraryThing reviews of Bill Hope: His Story, go here. For Goodreads reviews, go here. Likewise available from Amazon and Barnes & Noble. Coming soon: Death by water in Central Park.